LaCie's new rugged drive. Grrrr! LaCie has strengthened its portable hard-drive line-up with a device that's more rugged than Clint Eastwood with a hangover. The brilliantly titled LaCinema Rugged HD is a hard drive that packs in 500GB of storage and is compatible with any HDMI-supported TV. Essentially, this device allows you to bring hi-def movies and content on the road with you – which is a lot handier than packing a Blu-ray player and a bunch of Blu-rays into a rather large overnight bag. The LaCinema Rugged HD is also compatible with both Mac and PCs, and supports most codecs – including H.264, MKV, WMV9, MPEG-4. To make the hard-drive as rugged as possible, LaCie has added a scratch-resistant aluminium shell, internal anti-shock absorbers, and a shock-resistant rubber bumper which is said to protect media files against everyday blunders. We think it looks like it can stand a nuclear holocaust, but for some reason that's omitted from the press release. For all the number crunchers out there, you'll be glad to read that the hard-drive can hold up to 700 movies, 165,000 songs or 165,000 photos. And if you want one, expect to pay around the £260 mark. 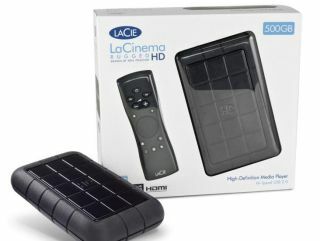 Visit www.lacie.com/uk for more details.